Update: Apparently, Mnuchin is regretting giving his twitter username and password to his aides at Treasury and/or his wife. After retweeting a tweet from a Trump fan account Wednesday morning, Mnuchin has deleted the retweet and would like the world to know that this wasn't an "authorized" tweeting. The tweet was retweeted from Mnuchin's account this morning, but the original was sent last night, which probably accounts for the incorrect timing given in the Treasury Secretary's follow up. President Trump made his frustration with GM abundantly clear on Tuesday when he threatened to cut all EV subsidies to the Detroit carmaker. But on Wednesday both the president, this time joined by Treasury Secretary Steven Mnuchin, took the administration's attacks on GM to their next logical endpoint: Demanding that the federal bailout recipient return the $11.2 billion loss eaten by taxpayers from the federal bailout that the company received during the depths of the financial crisis. "If GM doesn't want to keep their jobs in the United States, they should pay back the $11.2 billion bailout that was funded by the American taxpayer," read a tweet from a Trump fan account that the president and Mnuchin retweeted. Trump also retweeted two tweets about illegal immigration. 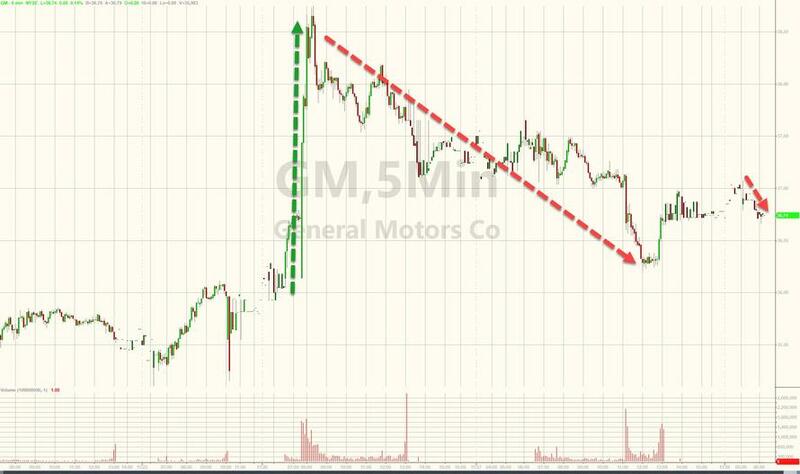 GM shares slid after Trump's tweets Tuesday afternoon, but GM stock futures showed little immediate reaction to Trump's threat. GM received billions in bailout money to shore up its troubled financial arm GMAC in 2008. After spinning off the subsidiary (which now trades as Ally Financial), GM saddled the Treasury with a more than $11 billion loss. After meeting with GM CEO Mary Barra, Larry Kudlow told reporters on Tuesday that he had conveyed the president's anger to Barra, and explained that Trump feels betrayed by GM, and that he believes the carmaker "turned their back on him" by announcing the layoffs and plant closures, particularly after the Trump tax cuts handed billions of dollars back to corporations and allowed them to repatriate overseas cash. Politicians on both sides of the US-Canada border were outraged by GM's Monday announcement that it would close 5 North American plants (and two foreign plants) and fire nearly 15,000 workers in the US alone. Trump blasted the company for opting for layoffs and closures in the US while plants in Mexico and China remained open.